Presenting Facets + Highlights as part of Mirror Mirror offers Compiler an opportunity to re-examine work from the past year and reflect on themes and questions raised in the shifting context of the annual MA Digital Culture expo. Twin Pixel, ‘music/encryption boxes’ from Art:Work and the automated online gallery from ≈ Pretty Close ≈ each demonstrate a different approach taken towards investigating the socio-political challenges of digital culture. However, they also mark the changing face of interaction for Compiler, the evolving discourse with their audience, computational processes and each other. 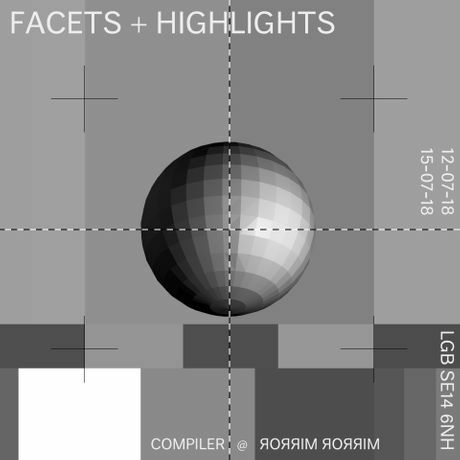 With the aim of rendering these internal operations transparent to both our audience and ourselves, Facets + Highlights actively uses the conception of memory as the future and past implicated in the present and of the archive as a ‘pledge to the future’ (Derrida, 1995). In doing so, it pokes at the interfaces and intersections of organisational, conceptual and aesthetic work within Compiler, and reflects them as reciprocal domains of labour.